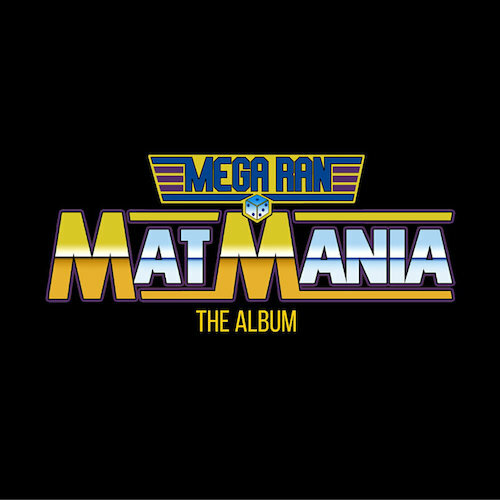 RapReviews.com Feature for March 29, 2016 - Mega Ran's "Mat Mania - The Album"
I feel it's in the interest of full disclosure to state an inherent bias toward the "Mat Mania" project going in. I appeared on the 8th episode of the podcast of the same name thanks to my friendship with Random and unapologetic interest in professional wrestling. I think when it comes to "the nerdy pursuits" in hip-hop, there may be few people I have in common with than Raheem Jarbo. In 2016 video games and WWE are both billion dollar business, but there was definitely a time when people looked down their noses at both, and as any of us who grew up a child of the 1980's, hip-hop was often talked about in the same dismissive tones. I can't tell you how many times I heard "rap's just a fad" and "that's not even real music." I don't need to spend the whole review drawing the parallels for you though - the sheer amount of comic book and pro wrestling references in rap songs tells you there's an undercurrent that runs through them all as "outsider" cultures that gradually became part of the mainstream entertainment landscape. And as art imitates life and vice versa, there have been very real issues with racism in pro wrestling over the years, and that's where we have to draw a clear distinction as to a parallel that does't exist. Hip-Hop was able to set its own tone from its inception in the 1970's to the present day, but African-American wrestlers didn't write their own story in most cases entering the "grappling arts." The 1990's in particular were a case of extremes (pun intended) where some black wrestlers became world champions while others were expected to act like embarrassing parodies of Haitian Vodou. The unfortunate truth of being a wrestling fan is that these aren't isolated incidents, and you either learn to live with them or your discomfort pushes you away from the "sports entertainment" business for good. Thankfully Random wasn't pushed away, though if he had taken exception to Triple H acting like he was a "towel boy" or Ric Flair telling Booker T to "carry his bags" back in 2003 I wouldn't have blamed him. These things nearly killed off my own renewed interest in pro wrestling, but for reasons I can barely fathom in hindsight I actually doubled down instead. I started following "the indies" to counteract whatever I didn't like from WWE, explored the available alternatives on PPV, and kept on believing that the good was better than the bad and it was still worth celebrating what was good. "Mat Mania" is that album in a nutshell. This is the Mega Ran and Lynx Kinetic tribute to what's good without any kind of political statement on what's bad. There might be a place for a rap album to address the problematic history of pro wrestling over the years, and if there's any man I'd trust to do it, Raheem Jarbo is that man. As this time of year is the "Road to WrestleMania" though, the single biggest wrestling show of the season, it's time to kick back and fondly reminsce about the good things -- like how damn entertaining Macho Man was. There is a moment when all of these issues come full circle in the squared circle though intentionally or otherwise. If there's a rap wrestling stable that perfectly intersects all of the worlds I've talked about - comic books, video games, hip-hop and sports entertainment - it's The New Day. They've individually had their own share of bad gimmicks. Xavier Woods once had to play an Apollo Creed knockoff called Consequences Creed. Big E. was once forced to play the hired muscle of other WWE heels, even having to fake a love interest in another female wrestler his employer was feuding with. I told you that wrestling is littered with these kind of incidents and even in its original inception The New Day was problematic. As Ran raps so eloquently though the group overcame the odds against them through the irony that they were supposed to be heels but "thanks to the power of positivity/we instantly rearranged the entire industry." Perhaps the single coolest thing about the entire "Mat Mania" album though is the run-in by fellow pro wrestling fan Murs, who once did a remix featuring guest bars from John Cena. His fandom of the squared circle comes through loud and clear as Lynx Kinetic links them up with a reinterpreted version of Bray Wyatt's entrance theme for the aptly named "Run." Mega Ran's bars throughout the album are top notch but on this track Murs steals the show and offers his "cheers to the villian" - much like Wyatt's fans do for his appearances. It's not a perfect album (nor a Mr. Perfect album) to be sure. Chris Jericho is a natural choice for a hip-hop update given his natural swagger, but when Ran says he "knew when Lynx Kinetic gave me this beat we would make something cool" it's just not true. The bars are a worthy tribute to Y2J but the beat doesn't bump and it might have been better to rap over an actual loop of Jericho's entrance music. "Closed Casket" does just that for The Undertaker and it's one of the album's top tracks, as is the chopped up "Here Comes the Pain" for Brock Lesnar. One might ask "How far can this album go with WWE's litigious practices with enforcing their copyrights" and the numerous WWE related samples? Well they probably can't complain about the Macho Man music because they don't own "Pomp & Circumstance" but there's definitely other issues they could come down on if they wanted to. That being said Ran has some experience in this area, and actually got Capcom to give him the clearance to have unrestricted Mega Man samples on his albums. I'm not saying he can pull that off again here, but for now this album exists and there's no better time to take advantage of the name your own price option (which may itself be a way to dodge the copyright bullet). Give "Mat Mania" a chance even if you're not a fan of pro wrestling.